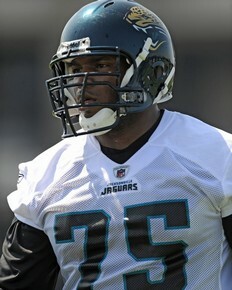 The holdout for Jaguars rookie OT Eugene Monroe reached Day 5 on Thursday, but the club appears ready to stick with its stance in negotiations and a big part of the reasoning behind the team’s tough stance is what it has seen so far from veteran LT Tra Thomas, who has been impressive at camp. Thomas, a 12-year veteran and three-time Pro Bowler, is a proven pass protector and he also is a bargaining chip in negotiations with Monroe. Should Monroe’s holdout continue for an extended period, Thomas will become the starter and likely keep the job the entire season. Monroe has to be sitting back and watching Thomas, and it would be smart for talks to get going and advancing, so that way he can get it, start learning more, and being an impact on a Jags O-line that is counting on him in 2009.